Axial T2-weighted image shows optic nerve tortuosities (arrowheads, A). 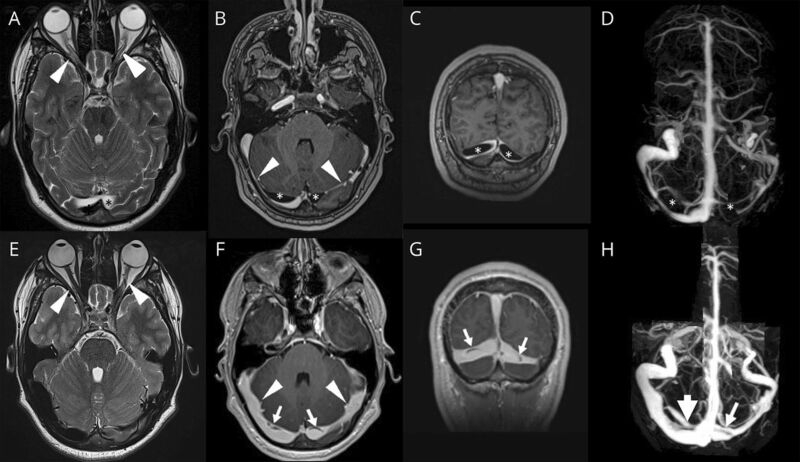 Axial (B) and frontal (C) postcontrast T1-weighted imaging and magnetic resonance venography (D) reveal giant arachnoid granulations (GAG) (asterisks) and sinus lumen stenosis (arrows, B). Five days after lumbar puncture, optic nerve tortuosities (arrowheads, E), GAG (arrows, F–H), and sinus lumen stenosis (arrowheads, F) disappeared. G. Taieb: analysis and interpretation of data, drafting, critical revision of manuscript for intellectual content. C. Dargazanli: drafting and revision of manuscript, acquisition of data. P. Prin: acquisition of data, critical revision of manuscript for intellectual content. M. Charif: critical revision of manuscript for intellectual content. A. Ducros: analysis and interpretation of data, drafting, critical revision of manuscript for intellectual content.
. On the pacchionian bodies. J Anat 1920;55:40–48.
. Ultrastructure of the meninges at the site of penetration of veins through the dura mater, with particular reference to pacchionian granulations. Investigations in the rat and two species of New-World monkeys (Cebus apella, Callitrix jacchus). Cell Tissue Res 1988;251:621–631.